Saturn's active, ocean-bearing moon Enceladus sinks behind the giant planet in a farewell portrait from the international Cassini spacecraft. 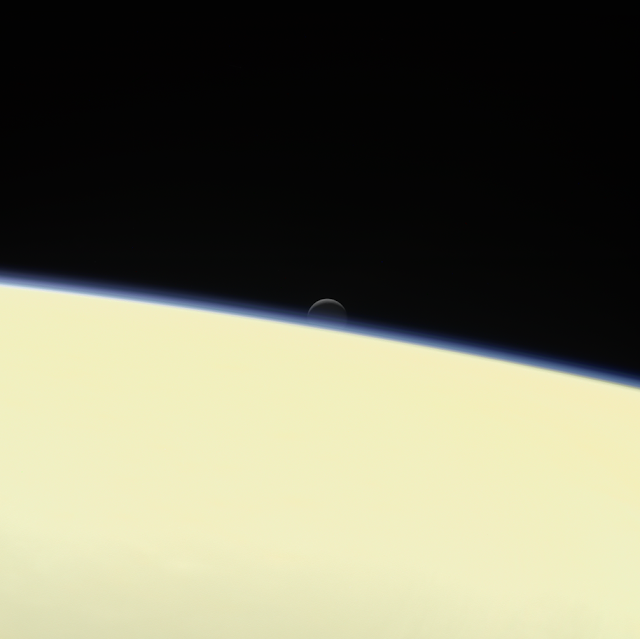 The image was taken on September 13, 2017 and is among the last images Cassini sent back. It was taken using Cassini's narrow-angle camera at a distance of 1.3 million km from Enceladus and about 1 million km from Saturn. Image scale on Enceladus is 8 km/per pixel. Images taken using red, green and blue spectral filters were assembled to create the natural colour view. The Cassini–Huygens mission is a cooperative project of NASA, ESA and the Italian Space Agency.